I highly recommend that anyone with an interest in the McCord Cemetery check out the "virtual" cemetery at the Find A Grave website (http://www.findagrave.com/). Our extraordinary volunteers have been working overtime to create what is perhaps the most well-documented cemetery on this popular website. Jeanne has posted a memorial for every known burial at McCord (all 261! ), many with headstone photos, biographies and/or obituaries. A very special "thank you" goes to Lemar and Linda for the photography. With some of the older stones starting to deteriorate, their photographs help preserve these images for all time. When genealogist have questions about birth or death dates, there's nothing like seeing it "set in stone!" 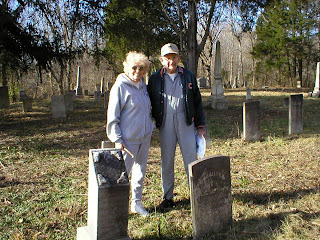 Linda & Lemar at McCord, standing behind the stones for Joseph Thompson Williams (1818-1894) and his wife Drusilla Ann Knight (1829-1873). I had given up ever finding these headstones! Many thanks to Linda & Lemar! To locate McCord at Find A Grave, you can click on this link (http://www.findagrave.com/cgi-bin/fg.cgi?page=cr&CRid=106799&CScn=mccord&CScntry=4&CSst=16) or simply go to http://www.findagrave.com/ and click on "search for a cemetery" and enter McCord, Illinois, Montgomery County. From there, you can enter a specific name you are looking for, or browse through all of the burials at McCord. I hope that other family history researchers can find a long-sought "treasure" here like I did!